Are you looking for something to do during the April school holidays? 10.00 am - Intermediate coaching programme catering for Juniors playing competition in the Lower to Middle divisions. 11.00 am - Squad training - this coaching programme caters for the middle to higher level juniors through to Advanced Junior players. The cost is $100 for the 4 days in Clinic 1 or $75 for the 3 days in Clinic 2 or $30 per individual day. 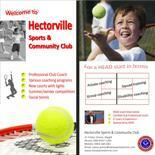 4.00 pm - Hot Shots coaching programme catering for beginners (Red ball) through to Orange ball & Green ball match players. 5.00 pm - Intermediate coaching programme catering for Juniors playing competition in the Lower to Middle divisions. 6.00 pm - Squad training - this coaching programme caters for the middle to higher level juniors through to Advanced Junior players. The cost is $100 for 4 days in Clinic 1 or $75 for the 3 days in Clinic 2 or $30 per individual day. or Tennis coaching in any form.